- Select base background from your camera or the native photo library. - Export image to your native photo folder. - You can customize 2 lines of text, perfect in case you lose your device. 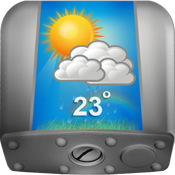 - Real Time weather data, you can search any place using our interface.